A state practice that has gained much attention in discussions of integration and streamlining the enrollment processes of health and human services programs is ELE, discussed briefly above in connection with Louisiana’s renewal of children’s health coverage. A new option created by CHIPRA, ELE permits states to provide children with Medicaid or CHIP based on findings from other public agencies. Even if the other agency uses a methodology for determining eligibility—such as household definitions and income disregards—that differs from Medicaid and CHIP methodologies, the other agency’s findings can be used to qualify children for health coverage. This eliminates the need for the health program’s case workers to “cross-walk” information from the other agency’s case files to see how it fits into the slightly different rules used for health coverage. It also means that families are not required to provide additional information that may be needed to address minor differences in program rules. “Deemed” eligibility, comparable to ELE, has long been used by many different programs across the country, which apply different names to the same basic concept. For example, pregnant women and infants automatically qualify as “adjunctively eligible” for the Special Supplemental Nutrition Program for Women, Infants, and Children (WIC) based on their receipt of Medicaid; children are “direct certified” as eligible for the National School Lunch Program (NSLP) based on their receipt of SNAP or Temporary Assistance for Needy Families (TANF); and through “categorical eligibility,” SNAP eligibility extends automatically to households in which every member receives Supplemental Security Income (SSI), TANF, or other cash assistance. One option available to states implementing ELE is automatic enrollment, through which children can receive health coverage without filing standard Medicaid applications. Louisiana was the first state in the country to implement ELE auto-enrollment, and the second to implement ELE in any form. The Louisiana Department of Health and Hospitals (DHH) worked with the Department of Child and Family Services (DCFS), which administers SNAP, to implement an enrollment and renewal process that qualifies children as financially eligible for Medicaid based on data matches showing SNAP receipt. Louisiana applies ELE to both initial enrollment of previously uninsured children and to renewing coverage for Medicaid beneficiaries. SNAP findings about income, state residence, identity, and Social Security Number (SSN) are used to satisfy Medicaid eligibility requirements. The state matches records between the programs, based on identifying information such as name, SSN, and address. However, the SNAP program’s verification of a child’s citizenship or satisfactory immigration status is used to establish Medicaid eligibility only if the evidence meets standard Medicaid requirements. Otherwise, these non-financial requirements are verified through typical Medicaid procedures. Much of the initial funding for development and implementation of this practice came from the above-described “MaxEnroll” program, which proved particularly important in funding necessary information technology (IT) improvements. Implementation of ELE also required coordination between two separate agencies: DHH (the agency responsible for Medicaid) and DCFS (the agency responsible for SNAP). State health officials met twice per week, spending months to plan implementation. Once the program was underway, DHH drafted and paid for all mailings to SNAP recipients, which reduced the cost and effort required of DCFS. DCFS supported ELE as helping meet the needs of the agencies’ shared low-income clientele while generating administrative savings for taxpayers. Louisiana’s ELE implementation began in late 2009. DHH matched SNAP and Medicaid records to identify children who received SNAP but not Medicaid. To prevent duplicate enrollment, the state began by covering SNAP-recipient children who previously received Medicaid or CHIP but no longer participated. With other children, the state delayed enrollment until conducting further investigation to ensure that they weren’t actually receiving Medicaid but described differently in SNAP records—for example, with a nickname rather than a formal first name, or with an SSN or address that had several digits reversed. The state sent letters to families whose children were in the group slated for initial enrollment. The letters explained that, if families did not “opt out,” their children could be enrolled in Medicaid, based on their receipt of SNAP. Less than one percent of the letters’ recipients opted out, and the state prepared to enroll the remainder into Medicaid. Before the state could do so, however, clarification from CMS forced a change in direction. “Opting out” is sufficient to authorize data matching between SNAP records and Medicaid records, explained CMS officials, but enrolling children into Medicaid coverage requires 8affirmative consent from their parents, under the federal ELE statute. To meet this requirement, the state informed parents that it would send them Medicaid cards, and that using the cards to access care would signify affirmative consent to enrollment. CMS accepted this as meeting statutory requirements. In February 2010, Louisiana mailed Medicaid cards to more than 10,000 children who had qualified for Medicaid in December 2009 because of SNAP receipt. The state also enrolled children into Medicaid based on monthly SNAP applications, starting in January 2010. For this ongoing, monthly process, parents could “opt-out” of data sharing on the SNAP application form. When those who did not opt out qualified for SNAP, their children’s identity was compared to records of current Medicaid enrollees. Children not participating in Medicaid were sent Medicaid cards, and their parents could complete the enrollment process by providing affirmative consent through using the cards to access care. 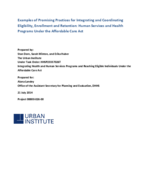 In November 2010, Louisiana began using ELE to renew coverage for all families whose Medicaid households consisted entirely of children with SNAP cases, regardless of how or when those children originally joined Medicaid. However, when it came time to renew the first group of automatically enrolled ELE children, the state experienced problems because of its IT system. Different renewal procedures applied to (a) ELE enrollees who had consented through card use and (b) those who had not yet used their cards. However, children’s utilization of services could be analyzed only by accessing the state’s claims payment system, which could not communicate with the state’s eligibility system. As a result, the expensive manual involvement of state staff was required for renewal. To prevent this problem from recurring, state officials changed to a new consent policy that would permit renewal without any need to access data outside DHH’s eligibility system. Starting in January 2011, affirmative consent to enrollment was provided, not by using Medicaid cards to access care, but by checking a box on the SNAP form requesting Medicaid coverage. The check box was bolded, prominently placed at the top of the second page, and written in plain language, to maximize the chances that it would be read and understood. Auto-enrolled ELE children in Louisiana were almost as likely to obtain some services as other children, but among the children who received care, ELE enrollees tended to use fewer services. For children who used any health care, regression-adjusted average costs for ELE children during their first 12 months were just 48 percent of the average amount for similar Louisiana children who enrolled using other methods. As noted earlier, Louisiana’s use of ELE to renew children’s Medicaid coverage whenever all members of a Medicaid-enrolled household received SNAP allowed a substantial automation of renewals, with a small but statistically significant increase in the number of children receiving continuous coverage. Altogether, approximately 330,000 children had their Medicaid coverage renewed via ELE between November 2010 and November 2012. Primarily by automating the ongoing renewal of a sizable portion of the state’s Medicaid caseload, the state achieved roughly $1 million in net, annual administrative savings. State officials overcame several challenges. ELE implementation required considerable time and patience from state staff– especially with two different agencies administering Medicaid and SNAP. States with a single agency administering both programs would probably have had an easier time implementing this ELE approach. State policymakers also noted that they may have been able to move more quickly if a single project manager had the authority to make final decisions once issues were thoroughly explored by the interagency team. Roughly half of the children initially enrolled via ELE saw their Medicaid coverage terminate in November of 2010. Most terminations involved children who never used their cards and whose parents did not consent to enrollment at renewal. But among the children whose parents had consented to enrollment by using their card, at least 92 percent retained Medicaid.